our recent home renovation. I LOVE IT! It’s light and a bit feminine. Before, the upstairs was one big master bedroom (below). where the half wall was (she’s so brilliant). with more office storage…a shambles right now. Perhaps another post someday. 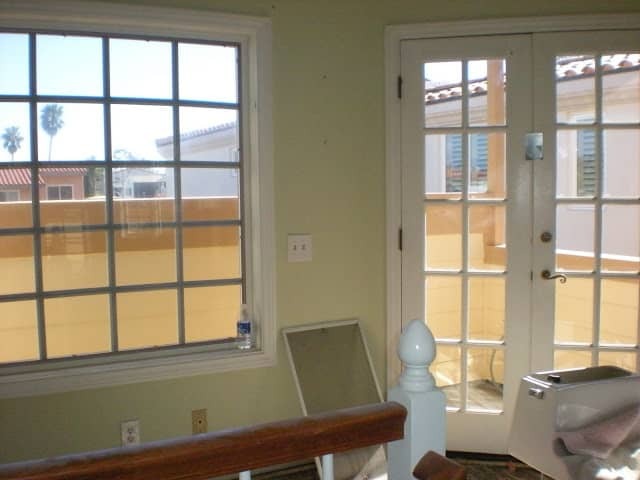 This is the space before. On my desk is a Limoges plate that was my maternal grandmother’s. The personalized pencils also make nice gifts. They come in lots of colors from Oriental Trading. The round box is from a Paris flea market and holds paper clips. Splurge on interesting file folders (sometimes you can find them at TJ Maxx). It makes getting organized more fun. My friend, Claire made this custom clip board for me. (right after I finish my tea and check out some other blogs). for great tour of pantries (and a mention of ours). Mary Ann, what a gorgeous office. So bright and feminine. Love your chair fabric and your blogging space looks very comfy. I love this spot! 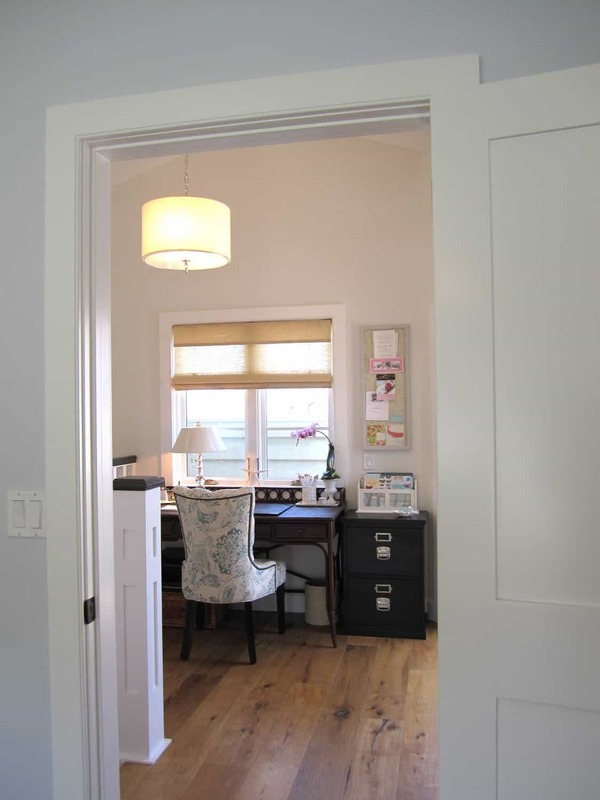 The light looks wonderful and you have managed to carve out a really comfy and usable office from a small unused space. Gorgeous! Love this space and the outer porch area too! Your new railing is gorgeous. 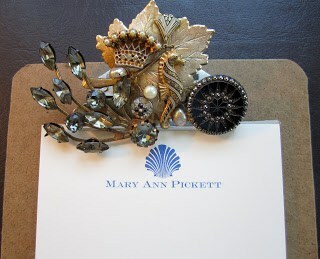 Wow Mary Ann, I love it!!! I will always picture you in your comfy chair in feet up blogging mode now!! You really have turned your abode into a jewel box! Oh Mary Ann, It's beautiful!! I can't find that pendant on overstock… per chance do you remember the name? Again, really wonderful space. Love the space – and that porch area too. I think I would be wandering out there all day! There seems to be so much light in your office. What an inspiring place to work! That really was a great idea from your girlfriend. It came out great. So cozy looking! I love this office and love your chair! Fantastic, Mary Ann. Love your new office. The clip board is perfect. You have really fixed it up cute. Love your outdoors space too. I am so inspired by this! Great office, and fun accessories, too. *** This turned out sooooo DELIGHTFULL, Mary Ann! I just love the lightness of it all, and having a lil' balcony makes it TRULY "YOUR" "special spot"!! Love what you've done to make it an office and you are so lucky that you have a patio right outside! This space is definately classic & casual! Great job and wonderful use of an unused space. what a lovely space!! 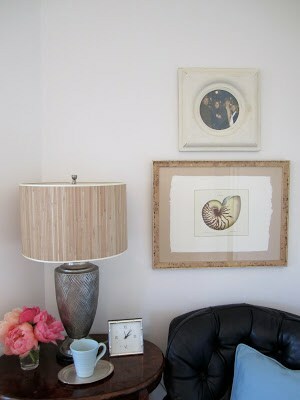 and i am in love with that clipboard and i always get excited when i see beautiful rooms that use items from overstock. What a beautiful space! I love the desk area and the chair to prop your feet up! Just lovely! Sweet space. i am officially jealous! It looks glamourous! Way to use that space! It's beautiful and cozy! Love all the little details that personalized the space just for you. I officially want personalized pencils in hot pink! Thanks for sharing! It doesn't take a lot to "wow" us just a little slice of working space with lots of light and we're hooked. 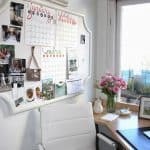 It's really great and the organizational touch is perfect to keep a focus and stay motivated to work just a bit longer during the day. Thanks everyone. I can't find the pendant on Overstock.com anymore. I just bought it a couple weeks ago. They have others…. how great to carve out a little quiet space for yourself. and with a great view and patio as well. thanks for stopping by the other day to comment on my file cabinet! 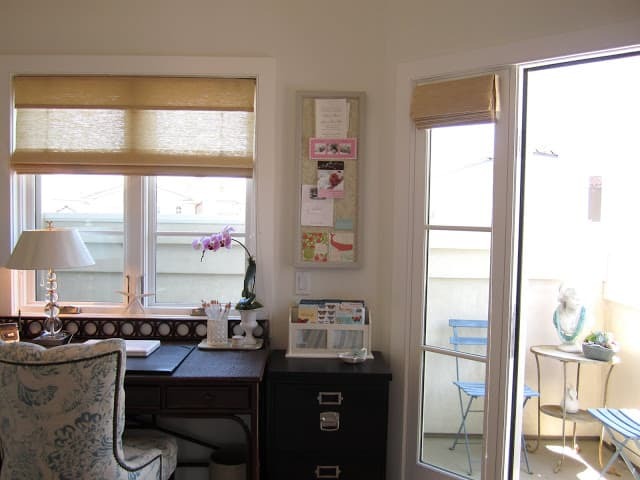 a lovely home office…love the stationary! What a wonderful space…love all the details! 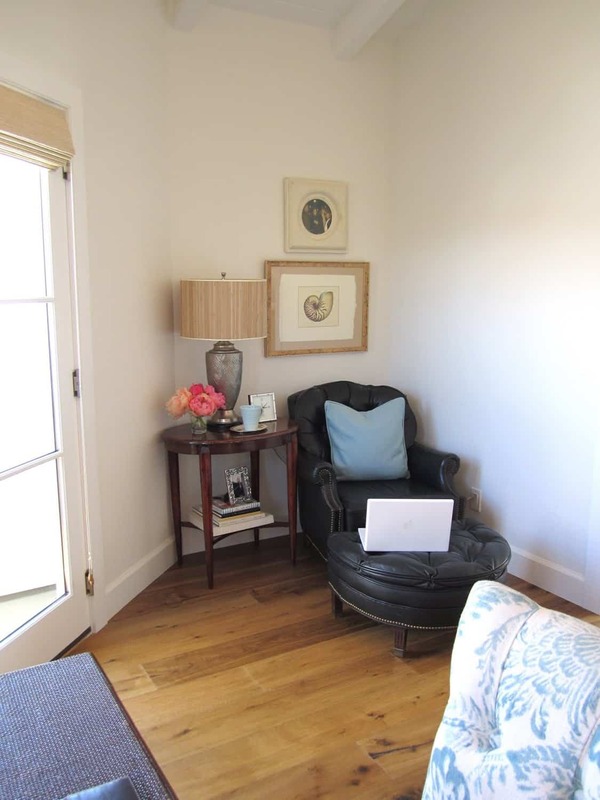 So nice to have a cozy stylish place to blog and surf! Also love that you have a balcony there with light and fresh air..enjoy! Love your new office! The fabric on the chair is great, the room has great light…love all the little details from the personalized pencils to the gorgeous holder they are in, everything about it is perfect. 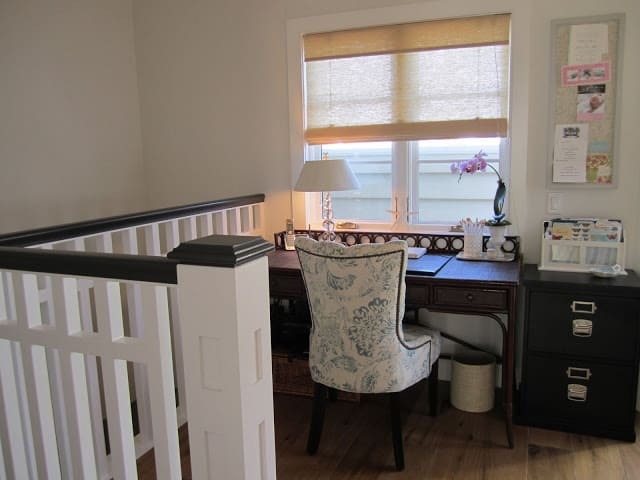 I personally love smaller home offices, they just feel that much more cozy and intimate. Enjoy it!! I have yet to see a room in your house that I didn't fall in love with. This is so you! Impeccable taste. Gorgeous! Saving this to my pinterest board! You inspire me! It's just perfect. Great way to maximize extra space in your home. What a beautiful office space! What a great idea it was, carving out the space at the top of the stairs! I love the comfy blogging corner! Beautiful job all around. Thanks for sharing. I love your office space! What an amazing transformation. You have made the space so much more functional, and it looks bigger now! Very well done. 🙂 The personalized clipboard and pretty file folders make organizing fun!! brilliant! it looks gorgeous…great transformation!! Oh, what a beautiful space! How smart to put up the wall. Your desk area looks wonderful. I'm looking for a similar desk! Wow, that looks awesome & converting that unused space into a functional office was a great idea. Love it!!! Also, love your adorable office chair! Mary Ann, this is absolutely gorgeous, just like the rest of your home! Great job! I love that little balcony off the office room, perfect! Where did you get the holder for your files? I have cute files in my new office, but they are just stashed in a drawer, and it isn't working very well. Thanks. All I can say is WOW!!!!!!! Great office space! 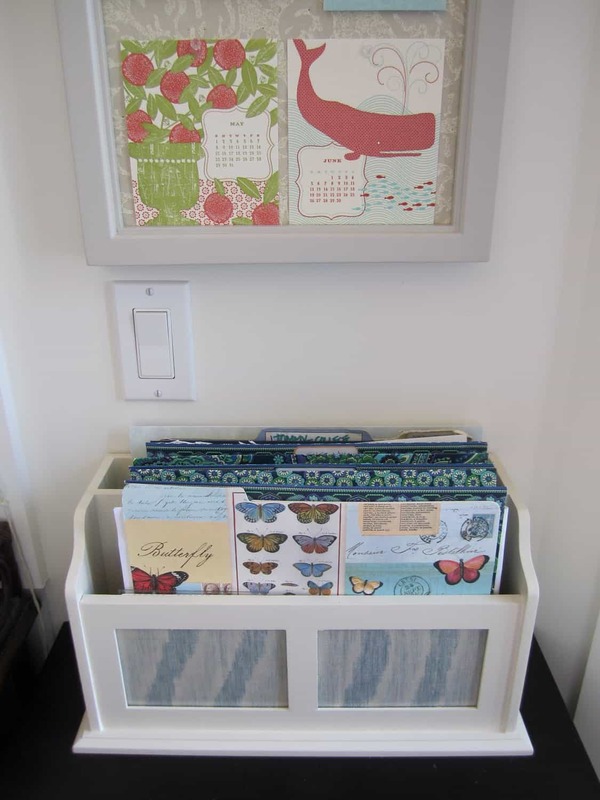 Cool clipboard and I love the idea of using pretty folders! It is so fabulous – I could get a ton of work done in that divine space. It is so gorgeous it should be featured in a magazine. I love this little space! Personalized pencils are so awesome, I thought it was such a treat to get those when I was younger. Perfect office space! Love it! What a beautiful working / retreat space…love the fabric on the chair and the cafe table set outside. I would be sipping cappuccinos out there. Lots of sunshine. How fabulous that you created an entire office/retreat out of space that you really didn't need. It's amazing what you've done and how great is it that you have outdoor space too. 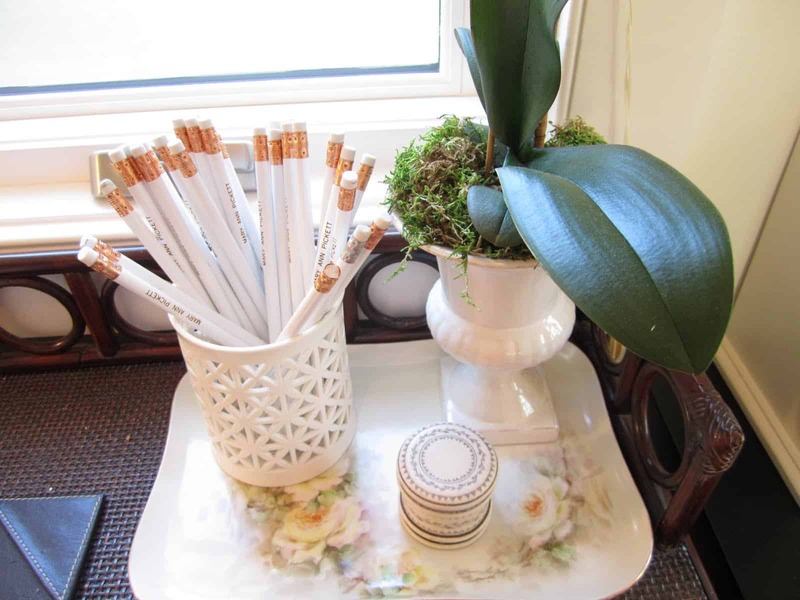 Love the little succulent box in your outdoor space and the personalized pencils…what a great idea! Love every detail! Thanks so much for your sweet comment! I hope to have the "studio" done soon! I LOVE this little office nook. The wall and door was an excellent idea. What a cozy, yet airy space. The floor and stair railing is amazing! Thanks for sharing your new office with BC Good Life Wednesdays party. It looks lovely, an ideal place to get some work done. Love the balcony too. Can you tell us where you got that desk chair? It's lovely! Beautiful space! I love the colors and the "feel" of the space. Please come and link this post up to our Wicked Awesome Wednesday Link party, if you get a chance. 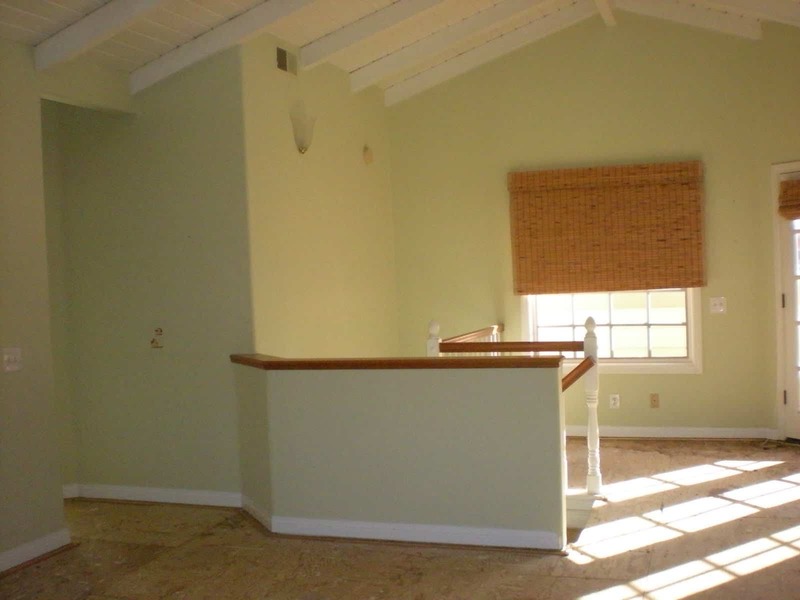 OH WHAT A GORGEOUS RENO…I love that quaint space..so inviting! A writer's retreat, that's what that is! May I rent the space out from you sometime…? I'll need lots of coffee and some of those white gorgeous pencils! What a beautiful blog…off to browse around some more! Come by anytime…I'd love to have you visit with me. What a lovely work (hiding) space! The wall was a great idea. I'm sure you'll be very inspired there! The chair is the Durham tufted from Home Decorator's. Decent quality. What a lovely space!! With your own little terrace to boot!! Love your tufted also – would never have guessed Home Decorator's. A room of one's own is such a wonderful thing!! Put my name on the "I love it" list too! This is soooo adorable, so stylish and pretty. You're so talented, Mary Ann. So proud of you! Hi Mary Ann, This is such a wonderful office space you have created. I love that you closed off the loft style bedroom. 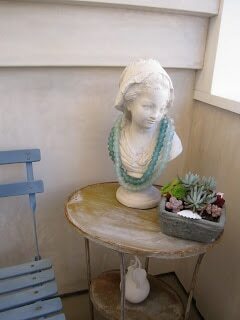 The blue and white chair and accessories are lovely. Thank you for joining my party this week. Mary Ann that is the most awesome office space. Every little detail is just perfect. What a lovely setting, inside & out. Have a beautiful PS week. It looks great, I love the black chair and ottoman, I would curl up on there all day at the moment! It looks fabulous Mary Ann, and what a wonderful use of space!! Brilliant! Everything works so perfectly right out to the patio. I am loving the stair rail! It is so different and fab! M.
Your little corner of the world is just perfect. Love your clipboard jewels! You inspire me! such a wonderful space. love all the details! Have a beautiful week. 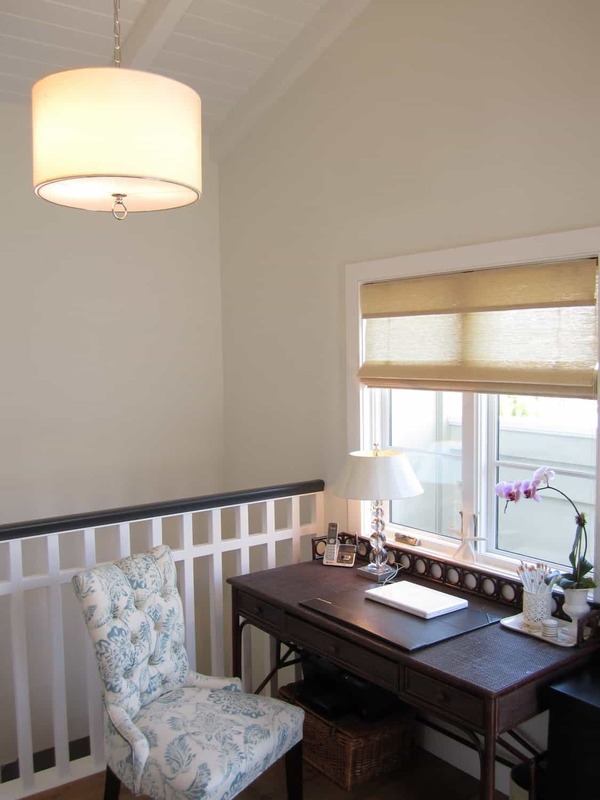 What a beautiful little space with all that natural light, your pretty desk area and the reading corner!! Your desk chair is fabulous! What a beautiful space! I love it! Wow, what a great space! So nice and bright … and I especially LOVE your floors! Your office space is so pretty. Love the desk, chair, and lamp. The touches are just perfect in every way. Thanks for linking this up to HSH! What great lil accents items u have in the office – i love it!!! 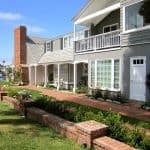 Coming over from Remodelaholic to say how much I LOVE your beautiful space! The addition of the wall was so smart. What a sweet little nook! New follower from Remodelaholic! that looks great! 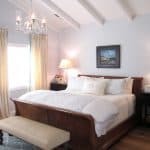 Visiting from Remodelaholic…I love this room, looks like a place I would like to be right now! Inspires me to get to work on my "office space" great job! I'm so jealous of your space… what a wonderful place to work! I saw your post when it was featured at Remodelaholic awhile back. You guys did an awesome job! 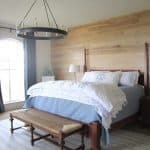 I loved the hanging fixture you chose and gave you a shout out in my post today, when I made my own DIY version. As per my view the most important thing about the office space is that it must contain a good environment to live in and to work according to that environment also a good office space or a open office space which makes our work much more frequently and easily. The only thong if our office environment will be good than we can perform our work with great efficient and honestly.